Synopsis: A research trip to the Arctic and a contract for a new book – life can’t get much better for David Rain. But as soon as David finds himself in the icy climes, he begins to write his legend of bears, dragons, and the mysterious fire star. Soon he realizes that his tale is beginning to mirror real life, and that an old enemy is on her way to meet him. Can David thwart her terrible plan? Or will his world be destroyed forever? In this fascinating book, Chris describes a race of beings that reside on a different vibrational frequency than humans. They exist in the realm of Dark Matter, where thoughts are substance. They are called Fain. The Fain have mastered inter-dimensional travel and often visit us humans, influencing our thoughts and overall aiding us in achieving spiritual enlightenment. This is a thought-provoking idea. . . 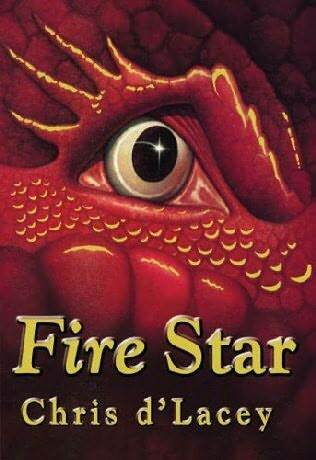 The concept of a fire star (a portal from the world of fain & dragons to Earth) is extremely exciting. It carries the same vibes as a mass revolution, shift of global consciousness, or any other momentous event. Throughout the novel, any reader will realize that tensions are beginning to increase. You can tell something high-scale is coming. When the climax finally comes to pass, readers will not be disappointed. D’Lacey, Chris. (2005) Fire Star. United States: Orchard Books. Synopsis: In the exciting sequel to The Fire Within, David must uncover the truth behind the mysterious clay dragons. David’s quest is to discover the link between the fire of the last known dragon on earth and the icy regions of the Arctic, It’s a journey that will bring him to the very heart of the legend of dragons and the mysterious, ancient secret of the icefire. . . .
Review: The stunning ingenuity of Chris D’Lacy expresses itself once again in the second installment of the Last Dragon Chronicles. In this continuation of the plot, David finally discovers the secrets of the Pennykettle Dragons, along with the uncovering of a link between polar bears and and dragons of ancient times. 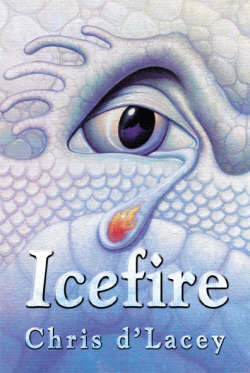 Icefire is indeed a step up on the maturity level compared to The Fire Within, yet the childish innocence of the first book manages to carry over as well. D’Lacey, Chris. (2003) Icefire. United States: Orchard Books. Synopsis: When David moves in with Elizabeth Pennykettle and her eleven-year-old daughter, Lucy, he discovers a collection of clay dragons that come to life. David’s own special dragon inspires him to write a story, which reveals the secrets behind a mystery. In order to solve the mystery and save his dragon, David must master the magic of the fire within–not only with his hands but also with his heart. Review: The Fire Within is one of those books that might not seem very special, or as if it would be a worthwhile read, yet is actually a story that will touch the hearts of all who decide to open its cover. In my opinion, the writing style of this first installment is most suitable for someone of a younger age than my own, yet the themes expressed have the ability to capture anyone’s interest. This easy read is a favorite of mine and will always remain so. Throughout the entirety of the novel, a prevalent theme becomes evident; We all have a fire within us, and it is called creativity. This message is expressed in every essence of The Fire Within. The protagonist, David Rain, finds his fire within while discovering inspiration. David manages this only with the help of his special dragon, Gadzooks who often writes ideas down on the notepad he was kilned with. David receives inspiring ideas from Gadzooks only in his imagination. Or does he? D’Lacey, Chris. (2001) The Fire Within. United States: Orchard Books. Synopsis: Marshall Seaver is being haunted. It begins with mysterious sounds, a fleeting face outside the window, a rogue breeze-all things that can be explained away. That is, until he comes face-to-face with a character who only exists on the pages of a sketchbook–a character Marshall himself created. Marshall has no idea whi he is being tormented by this forbidding creature, but he is quickly convinced it has something to do with his best friend, Cooper, who has gone missing. Together wih Cooper’s beautiful but aloof sister, Sydney, Marshall searches for the truth about his friend while ultimately uncovering a nightmare that is bigger and more frightening than he could ever have imagined. Review: D.J. MacHale has been one of my favorite authors ever since I feasted upon the Pendragon Series. His writing style is immensely captivating, keeping you on the edge of your seat throughout the entire book. This was the first horror I have read in a long time, and I must say MacHale seems to have a knack for the genre. I was surprisingly and utterly enthralled. D.J. MacHale definitely incorporates his ingenuity in all literature he has a hand in. His most recent project, The Morpheus Road Trilogy, is… unique to say the least. It was unlike anything I usually read, a true psychological horror with paranormal aspects. I have no regrets upon reading it though, I actually enjoyed it quite well. The characters were solid, the plot was intricate, and originality was rampant. For YA readers, The Light is assuredly a novel worth checking out. I found myself shocked, chilled, and in some cases disturbed while reading. If you are looking for a thrill ride that will surprise you multiple times, than the first installment of Morpheus Road will undoubtedly satisfy you. A hunger for horror and paranormal goodness will quickly be satisfied upon opening the cover. I am looking forward to read and review the next in the series, The Black. The prospect of continuing to indulge upon the story of Marshall Seaver is exciting. Ty: Can you tell us a little bit about yourself? J.D: I’m a twenty-something year old writer from New-Brunswick, Canada. Living the lifestyle that I do I’ve gradually become a compulsive multitasker. Quite frankly, it’s become an art. With only twenty-four hours in a day and three jobs, it’s necessary to make every moment count. In my limited free time, I enjoy reading as well as spending time with family and friends. Ty: What do you do when you are not writing? J.D: Mostly work! I have a full-time job at the local hospital as an Electroneurophysiology Technologist as well as own a photography business. Needless to say both occupations take a lot of my time. I do most of my writing at night for this very reason. Ty: Do you prefer writing with a pen and paper, or on a computer? J.D: I use a pen and paper when I’m jotting down ideas, or mapping a storyline. The writing however is done on computer. Ty: When did you first start writing? J.D: For as long as I can remember, I’ve enjoyed writing. When I was little I would draw storybooks and read them to my sisters at night. My favorite classes in school were always english since we had the chance to express ourselves through writing. However, even after several creative writing classes in university, I had yet to write anything longer than an essay. The idea of Silver and Stone came to me while on maternity leave with my daughter. Within six months, I had completed it. Ty: How did you choose the genre you write in? J.D: YA is the genre I relate to the most. It’s also what fills the bulk of my bookshelf, so I suppose it’s only natural that I would gravitate in that direction. I can’t imagine writing anything else at the moment. Ty: Do you ever experience writer’s block? J.D: I think every author experiences writer’s block at one point or another. My best advice is to keep writing. Every day, even if it’s only a sentence, write something. In my opinion writing is like a muscle. You have to work at it regularly. It’s a method that’s worked for me in the past. Ty: Is there any particular author or book that influenced you in any way either growing up or as an adult? J.D: There are many authors along the way that have influenced my style of writing. I love James Patterson. The pace of his novels is fantastic. He knows how to keep readers at the edge of their seats with every word written. I know it’s cliche, but J.K. Rowling is also a great inspiration to me. She is so talented, and her imagination is beyond compare. I would be happy to have even a fraction of her creativity. Ty: Can you tell us about your upcoming book? 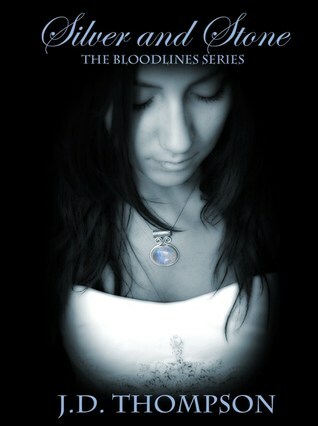 J.D: Blood and Champagne is the second book of the Bloodlines series, scheduled for release in early 2012. It picks up where Silver and Stone left off and is a rollercoaster ride to say the least. Stuck between the life she has and the life she should lead, Alexis will be faced with decisions that will put her most important relationships on the line. Without giving too much away, not everyone makes it out alive in Blood and Champagne. Fans of the series will not be disappointed. Ty: Is anything in your book based on real life experiences or purely all imagination? J.D: The setting in which Silver and Stone takes place is loosely based on my hometown. Holler Creek bares many similarities to life back home, from the mountains surrounding it to the general small town mentality. Weatherford Preparatory School is based on Bishops University, located in Lennoxville, Quebec. It’s campus is beautiful and definitely has the historic feel I was going for. Other than that, Silver and Stone is purely fictional. Ty: What was your favorite chapter (or part) to write and why? J.D: For obvious reasons to anyone who has read the novel, I loved writing chapter 18. Lucas is gorgeous so playing up his features was not a hard task to say the least. I think every girl dreams of a Lucas climbing through their bedroom window at one point or another. Ty: How did you come up with the title? J.D: When I first decided to write the Bloodlines series, I literally wrote down the entire storyline from start to finish. I had decided early on what names each book would bear. Every title ties into the events of each particular book, though they often only make sense once the reader reaches the end. Ty: What project are you working on now? J.D: At the moment, I’m working on completing the Bloodlines series. It’s still early to say where my writing will take me after. Ty: What has been the toughest criticism given to you as an author? What has been the best compliment? J.D: It takes thick skin to be part of the publishing industry. Authors face criticism on a daily basis and it’s not always pretty. Though I’ve been fairly lucky so far, I have had a few bad reviews. The toughest criticism I’ve received wasn’t so much criticism so much as general dislike. The reader just didn’t like the book. And that’s ok. Because as much as I’d like to, I can’t please everyone. Thankfully, I’ve also had many great reviews and feedback. I’ve been extremely fortunate so far and I can’t help but think that I have the best fans. My favorite so far has been receiving fan art. I love to see a reader’s interpretation of the characters and story through photos. It’s so surreal! J.D: Coffee, hands down. I’m ashamed to say I drink far too much of it, and given the choice on a deserted island, I would choose it over water. J.D: I prefer Mac, though at the moment the three computers I own are PCs. I plan to convert once they break down. Ty: Do you have any advice to give to aspiring writers? J.D: Be persistent. The whole process can be overwhelming and I know many writers give up before they even begin. If writing is truly your passion, don’t give up. I know that sounds completely cheesy but it’s the truth. Publishing takes time. And above all keep writing. Ty: Is there anything that you would like to say to your readers and fans? J.D: Thank you! Thank you! Thank you! I can’t say it enough. The support from fans has been astounding. It’s still surprising to me that any one person aside from my mother has willingly read Silver and Stone, let alone hundreds. It’s truly heart-warming. Ty: What did you think of this interview? J.D: The interview was great! Very fun questions to answer. I would like to express my deep gratitude for J.D. Thompson for an amazing interview! I am eager to review her next book in The Bloodlines series. You can check out my review of Silver and Stone if you haven’t already. Below is a synopsis of the book for those who are interested. Welcome to high school high society hell, where last season’s slingbacks can warrant a lunch table demotion, the wrong date will knock you off the it-list and behind every pair of oversized Chanel sunglasses lies a secret people are dying to keep. Synopsis: Oaths sworn. . . Loyalties tested. . . Forces collide. It’s been only months since Eragon first uttered “brisingr,” an ancient language term for fire. Since then, he’s not only learned to create magic with words–he’s been challenged to his very core. Following the colossal battle against the Empire’s warriors on the Burning Plains, Eragon and his dragon, Saphira, have narrowly escaped with their lives. Still, there is more adventure at hand for the Rider and his dragon, as Eragon finds himself bound by a tangle of promises he may not be able to keep. First is Eragon’s oath to his cousin, Roran: to help rescue Roran’s beloved from King Galbatorix’s clutches. But Eragon owes his loyalty to others, too. The Varden are in desperate need of his talents and strength–as are the elves and dwarves. When unrest claims the rebels and danger strikes from every corner, Eragon must make choices–choices that will take him across the Empire and beyond, choices that may lead to unimagined sacrifice. Review: Wow… I am at a loss for words, which rarely happens. I must express my deep gratification toward Mr. Paolini for reviving an emotion inside of me that I have not felt since many books ago… As my first ever perfectly rated book (100/100 points) I deem it appropriate to say this read was totally awesome!!! Although this is unusually immature for me, it is undoubtedly my true reaction. Brisingr brought out the best of enjoyment inside of me. A literal tingling pervaded my entire body as I read, especially toward the end of this phenomenal book. Once again, Christopher Paolini proves his indubitable talent for comprising a brilliant plot. I could compare his skill and craft to chocolate making, the perfect combination of essential ingredients that leads to an amazing finished product. Paolini is a true master when it comes to implementing characters into a plot, finding the environment that suits them the best. When it comes to the setting of the story itself, his ingenuity is unmatched. An entire world, the plot of Brisingr is built upon, a world of ceaselessly discovered detail. Simply spectacular. For those who eagerly await the next installment of The Inheritance Cycle, Inheritance, I feel your apprehension. How could anything rival the splendor of Brisingr? I have no doubt Christopher Paolini’s fourth and final book of the series will be the best by far. He has done it before with the earlier installments, and he can do it again. Join me in waiting as the closure of the Inheritance Cycle draws ever nearer. Join me, as the story of Eragon and Saphira finally ends. 37 days and counting. . .
Paolini, Christopher. (2008) Brisingr. United States: Alfred A. Knopf.